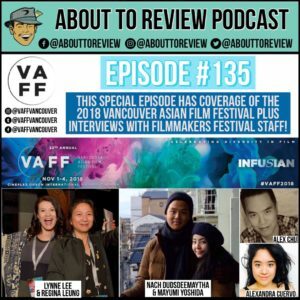 I took another trip to my home away from home recently, Vancouver, British Columbia, to cover the 2018 Vancouver Asian Film Festival for the first time! On this episode I talk about my favorite films, plus I had the opportunity to interview several people involved in the festival! The Vancouver Asian Film Festival (www.VAFF.org), or “VAFF” for short, recently held its 22nd annual film festival in the heart of Chinatown in Vancouver, British Columbia. This four day festival showcased over 30 films from around the world, ranging from documentary, to sci-fi, web-series, and shorts, along with including Canadian premiers of films that have been making the festival circuit. I was fortunate to be given the opportunity to cover the event, and I made the most of of my two days there by watching over 20 short films, 2 feature films, and attending two industry panels. During the weekend, I also had the chance to sit down with festival director Lynne Lee, sponsorship & PR coordinator Regina Leung, and several filmmakers including: Mayumi Yoshida, Nach Dudsdeemaytha, Alex Chu, and Alexandra Cuerdo. On this episode I discuss the two panels I saw on Saturday; “Diversity and Representation in Canadian Film and Television”, and “Asian Women in Film”, then I talk about my favorite short films, ending with my discussion of my favorite overall film from the festival. 2m:40s – 5m:45s: Thanking the people who made this trip possible and also information about the Vancouver Asian Film Festival. 5m:45s – 14m:50s: Discussion of the panel “Diversity and Representation in Canadian Film and Television”. The moderator was Bessie Chow and the panelists included Kashif Pasta, John Wirth, Sonny Wong, Lien Yeung. 14m:50s – 20m:50s: Discussion of the panel “Asian Women in Film”. The moderator was Ritesh Matlani, and the panelists were Olivia Cheng, Alexandra Cuerdo, and Mia Fiona Kut. 36m:00s – 40m:25s: My choice for my favorite film of the Vancouver Asian Film Festival is …. “For Izzy” (@ForIzzyTheMovie) by Alex Chu!